Congratulations to Dr. Doug Ray at Pacific Northwest National Laboratory on being named a fellow of the American Association for the Advancement of Science. AAAS will induct Ray into its next class for "distinguished contributions to physical chemistry and molecular spectroscopy, and for building a world-class chemistry organization at PNNL." Trained as a laser spectroscopist, Ray's most significant research used lasers and ion beams to determine the structure and dynamics of molecular clusters. 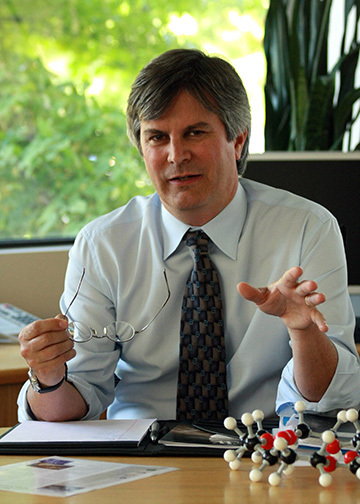 For the past decade, he has been leading teams of scientists at PNNL, first as deputy director of EMSL and then as the director of PNNL's Chemical Sciences Division. In chemical sciences, he led the establishment of the Institute for Integrated Catalysis, currently the largest non-industrial catalysis research and development effort in the United States. In 2006, he became the associate laboratory director for Fundamental & Computational Sciences. In this position, he leads more than 600 scientists in research ranging from earth system science to biological systems science, chemical and materials sciences, applied mathematics and computer science, and nuclear and particle physics focused on DOE's missions. He is especially enthusiastic about developing new tools for research. Current areas of emphasis include chemical imaging and analysis to understand how biological systems function and to understand and control how chemical processes occur, as well as the development of new computational methods to handle the vast amounts of data generated by extreme-scale simulations and new instrumentation. Ray earned a bachelor's degree in physics from Kalamazoo College Michigan in 1979 and a doctorate in chemistry from the University of California at Berkeley in 1985.